If a computer had a chance to put its ‘creativity’ skills to the test and come up with a hit musical, what would it look and sound like? It’s an interesting experiment and I am curious to see the result at Beyond the Fence, the world’s first computer-generated musical at the Arts Theatre in London. 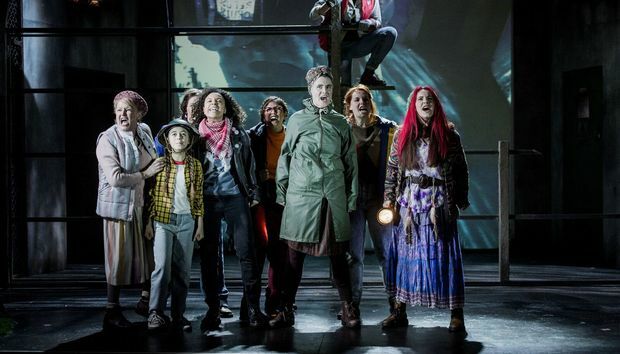 The musical features a strong female cast and is set in the 1980s, based on actual protestations that occurred at Greenham Common Women’s peace camp against US cruise missiles. Predictably, the musical kicks off with a high-energy number and then as it progresses we see the characters cry and laugh, and witness Mary’s struggle to get her young daughter George to speak again after she witnessed a brutal act. There is romance too as American soldier’s Jim, who one female character notes has “big brown eyes that are like a bowl of coco pops”, takes a shine to Mary and George. Despite my reservations in the beginning, the musical turns out to be quite enjoyable and after a while it’s hard to not warm to it. Even the songs aren’t bad. But was a computer responsible for coming up with the idea for the musical? And what was the balance in the musical between computer and human input? As predicted, the computers did much of the leg-work but lots of humans – with lots of patience – were required to make it come together. “The first stage with this was a huge study into musical theatre at Cambridge University. They studied 1,696 shows and from that they established various pointers which might point us towards a creation of a hit musical rather than a flop,” Benjamin Till, the show’s composer explains in a question and answer session to the audience. The panel of academics, writers and composers involved in the project then explain how a “What-If” machine was used to generate ideas for the musical. “We were given the task of wandering around the stage which had 600 pieces of A4 and each one had a sentence on it which started with the words ‘What if’ and the one we chose become the show you have seen tonight which is: what if there was a wounded soldier who had to learn how to understand a child in order to find true love? That’s where it all started,” explains Till. “We decided to put all of the keywords from the ‘What If’ into Google with the words Greenham and Common and the second hit of the first page was a reference and a link to something called the Greenham Common songbook. We didn’t put songs or musical theatre in that list but suddenly we realised that this was a world where music was part of these people’s landscape and that’s how we knew we were in the right place,” explains Taylor. Till and Taylor both emphasised the complexity of working with computers to deliver on this musical. There was the challenging task of having “four completely disparate timelines” and making them align to tell one coherent story. The song-writing was another complex task as there was “enormous amounts of data” to deal with. Around “25% of the lyrics” that ended up in the musical are computer-generated. And finally, how much did the composers interfere in the musical? “We felt that what we wanted to do every step of the way was to take the information the computers are currently able to do as far as it’s useful for our end result. And only when we felt that it could go no further was when we stepped in,” adds Taylor. Both Taylor and Till made no secret of the pain-staking process involved in working with the computers to create this musical. Yet the experiment points towards another example of big volumes of data being used to create a winning show. Netflix successfully used data to predict the runaway hit TV series House of Cards and is continually using data to find the next big hit. But for now in the world of musicals, computers are still a long way off from single-handedly developing a hit musical – at least without a helping hand from humans.